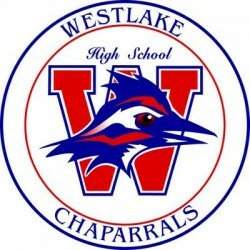 Logo of a high school football team located in Austin, Texas – the Westlake High Chaparrals. Football and athletics in general are a big part of life in all of Texas, but Westlake boasts a pretty large amount of successful athletes. They include baseball’s Kelly Gruber and Huston Street, a couple of Olympic athletes, and more pro football players than some colleges produce. That list includes Seth McKinney, Ryan Swope, Kyle Adams and 3 players who have played in Super Bowls – Justin Tucker and a pair of quarterbacks who won Super Bowl MVP awards, Drew Brees and Nick Foles.